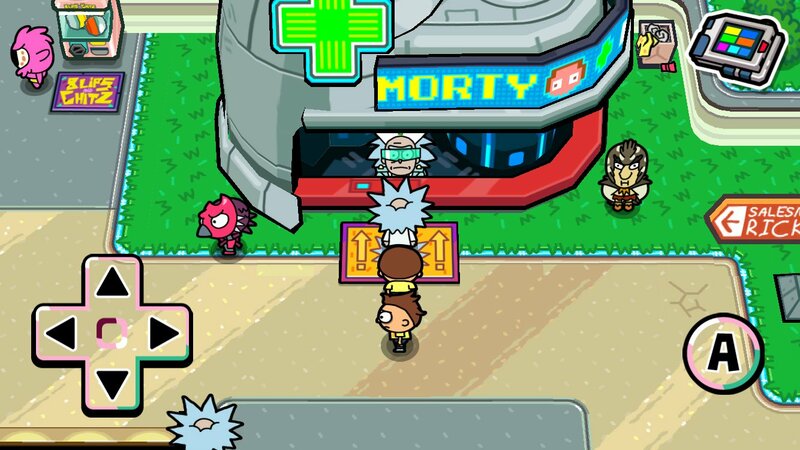 It’s been a while since I played a game on my phone as fun and fresh as Pocket Mortys. In fact, I really don’t play games on my mobile device much at all anymore unless I’m killing time at the airport or I read an article about something that piques my interest. 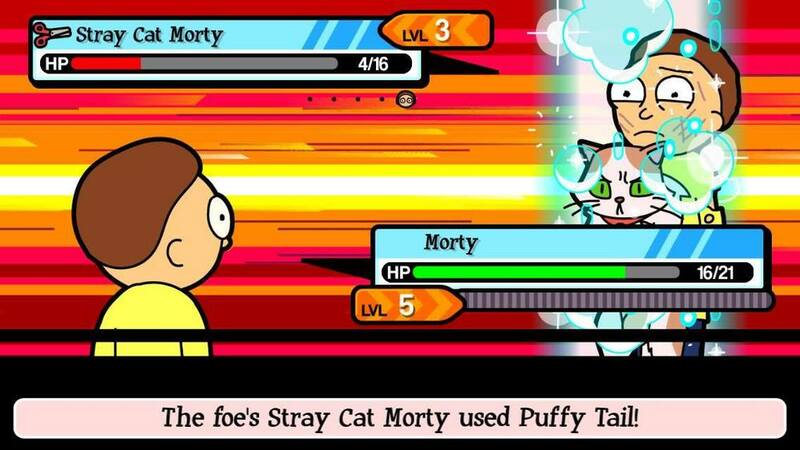 I forget exactly how I heard about Pocket Mortys, but the reason I knew I had to check it out was that I’d heard it was very strikingly similar to Pokemon. As 1.) A fan of Rick and Morty, 2.) A fan of the many fine and fun little games Adult Swim has put out over the years and 3.) A fan of Pokemon during my childhood, I knew I at least had to check it out and see what was going on here. The Pocket Mortys game icon. The premise of the game is pretty simple, and the tone of the game lines up really well with the tv show. Rick is up to his usual mad scientist antics with grandson Morty and is babbling on about his latest invention which will allow him to keep track of different Mortys throughout the multiverse when suddenly another Rick with another Morty emerges from a portal in the lab and challenges Rick and Morty to a battle. The Mortys end up duking it out for the Ricks. The Ricks and Mortys jump through the portal, and the original Rick’s portal gun is confiscated by a council of Ricks and can only be reacquired by beating the council in a battle of Mortys. Basically, you play as Rick and you collect these different types of Mortys. There are 82 different types of Mortys that you can battle and collect! Not a far cry from Pokemon’s “Gotta Catch ’em All”, right? Each universe you jump into is laid out like a typical Pokemon level, with a few wild Mortys you can battle or catch if you desire, trainers you must defeat, and a boss Rick at the end of each level. 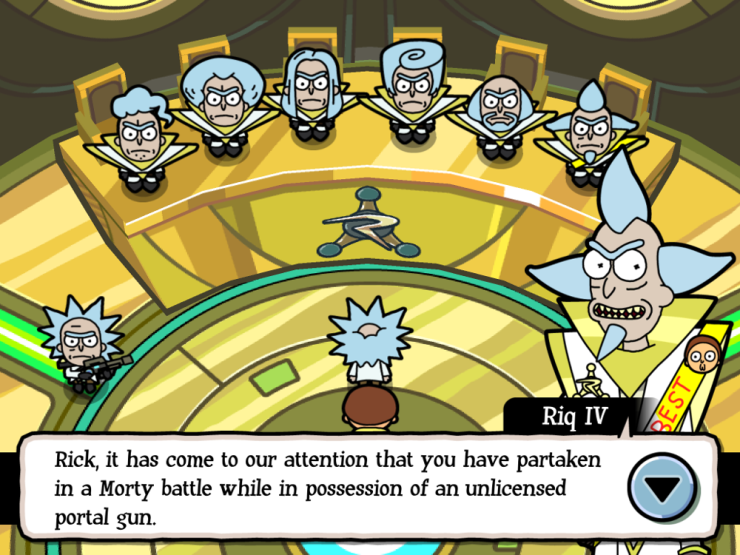 Then, as you beat a few levels you can go to the Council of Ricks and defeat the mega-boss Ricks. To Pokemon fans, this will all sound pretty familiar. I think I’m biased because I fall right into the target demographic for this game. You control your Rick by using a simple directional pad displayed on the screen, which is SO COOL and really smart. And then the “A” button appears on the right whenever there is something to interact with! It’s pretty much exactly like a old school GameBoy. An example of the game controls. There are a few things about this game that I really admire and are smart and creative. First off, the types/classes of Mortys. In the Pokemon game there was a fairly complex system where each Pokemon had a “type” (like plant, fire, water, rock, etc.) and each type had its strengths and weaknesses. While this was an integral concept to the game, it was always too hard for me to keep track of so many different types and their not-always-intuitive pros and cons, and I was not devoted enough to keep a matrix handy. Well, Pocket Mortys took this concept and did something brilliant with it. It is both a simple, intuitive system that works and is a complete parody of the Pokemon system. There are three types of Mortys: rock, paper, and scissors. Yup! You read that right. And the strengths and weaknesses are exactly like the game. Rock type attacks are strong against scissor-type Mortys, scissor attacks will do great against paper Mortys, and paper Mortys can beat rock Mortys with paper-type attacks. It’s easy to use and remember- no complicated matrices required! 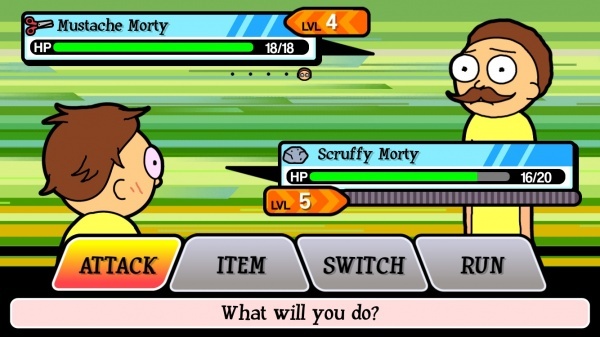 You can see from the icons that Mustache Morty is a scissors type and Scruffy Morty is a rock type. Secondly, this game took really core aspects of the Pokemon game and streamlined them. The design of the game is very logical and concepts are kept simple. 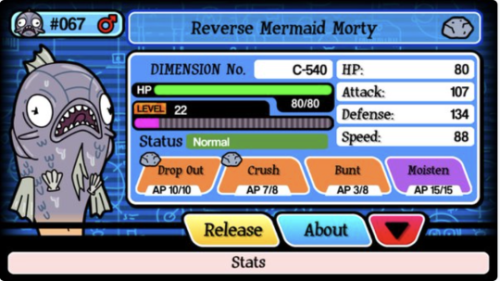 There are only a few different types of attacks that any of the Mortys can do, even though the Mortys’ attacks have different names- the mechanics and resulting damage is the same, but it feels like a unique experience with each type of Morty. And, instead of creating all these different towns like in the Pokemon game, each with their own layout, dungeons, healing center, etc., Pocket Mortys has only one town and instead you transport to several different dungeons. This saves a lot of time and effort in development. And while I really love the voice acting and sound effects, the script is even very efficient, as many conversations are only displayed as text on screen, keeping with the retro game theme. But Rick’s occasional random comments and Morty’s cries of pain and outbursts of “This is wrong!” keep me laughing while I’m playing. I generally dislike the concept of microtransactions, but I understand that they have their place in the gaming world today and that they can enhance a gaming experience. I feel that microtransactions should not be necessary or fundamental to enjoy a game, and here they are not necessary. I do get the distinct feeling that I would be more comfortable if I spent a few dollars in-game instead of running on bare-bones supplies, but it’s still possible to enjoy the game and not pay for anything. 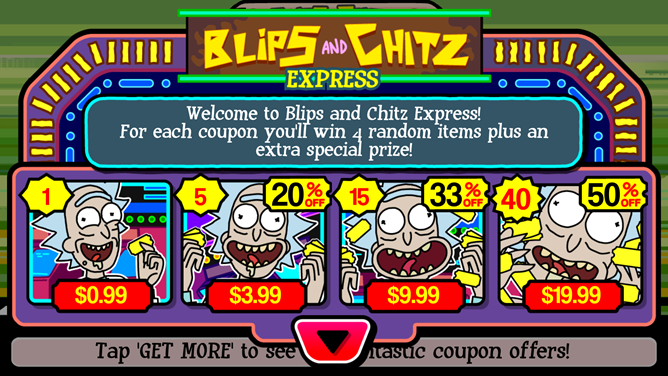 Blips and Chintz, where you can buy “coupons” to redeem for random prizes like Mortys and items. It’s worth noting that you can also watch advertisements to obtain extra Schmeckles (used to buy supplies,) which is something I also approve of since it’s an optional activity and Schmeckles can also be obtained by defeating opponents in-game. Pocket Mortys is everything I wanted out of a new Pokemon game. It’s a fun, easy to play game that quickly becomes addictive and as an added plus is silly and hilarious. It parodies the ridiculous things about Pokemon, epitomizes the Rick and Morty show, and entertains for hours. Major props to Adult Swim Games and Big Pixel Studios for a job well done. Pocket Mortys is available on iOS and Android and is free in the app store! This review was written using the Android version. The iOS game currently has a 5-star rating and the Android version currently has a 4.7 star rating.